When you walk up Langtang Valley, near Nepal’s border with Tibet, the strange appearance of the pine trees catches your attention. You’ve already grown accustomed to the old landslides that scar the steep slopes on either side of you: these landslides are a common sight in Nepal, especially after the heavy rains of the monsoon. But the trees are something different. Some of them—no, as you look closer you see it’s all of them—are lopped in half, like broken matches. As you continue walking, you reach a point in the valley where the trees have been uprooted altogether. A whole forest has been flattened, and the foliage has decayed into nothing, leaving rows and rows of fallen trunks arrayed in the same direction. It’s about this time that you catch a glimpse, farther up the valley, of the spot where Langtang village used to lie. 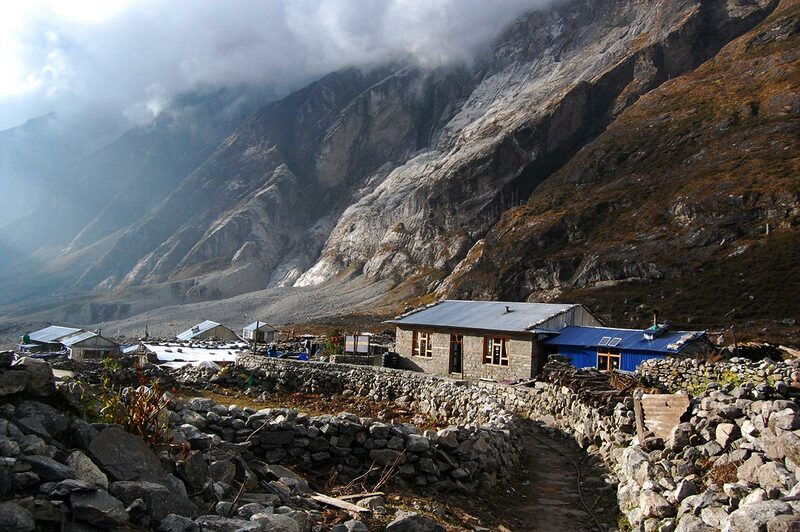 The inhabitants of Langtang Valley are thought to have migrated here from Tibet around 600 years ago. The name itself comes from the Tibetan words for yak (lang) and follow (tang). Legend has it that a Buddhist lama was crossing the Himalayas from Tibet to Nepal when one of his yaks escaped and bolted up a narrow gorge. The lama chased it—only to discover, to his astonishment, that the gorge eventually opened into a fertile plain. He spread the word, and before long a small community had settled here among the alpine grasses and wildflowers. When I walked up the valley in November 2016, I could see why it had been so attractive to those first settlers. Melting snows from some of the highest mountains in the world give moisture to the soil and thunder to the river. Rhododendrons bloom spectacularly in March and April, and pine forests are a source of firewood and timber year-round. Potatoes, turnips, barley, buckwheat and mustard fare well in the cool high-altitude climate. Lush pastures offer plenty of grazing for yaks, which provide milk and cheese, and mules, which carry rice and other supplies from the valley mouth. 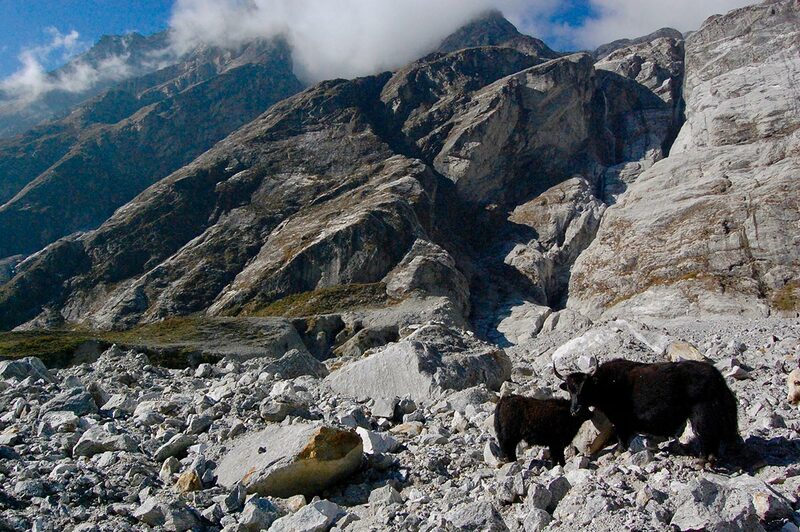 Yaks among the rubble of the 2015 Nepalese earthquake. Avalanche! He and the others had just enough time to take cover before “the wind” was upon them, ripping roofs from houses and pelting everything with snow and ice. The force was so powerful that it ripped a baby from a mother’s arms and carried them several yards from where she was standing. The baby was later found, half-buried in snow and with two broken legs—but miraculously alive. 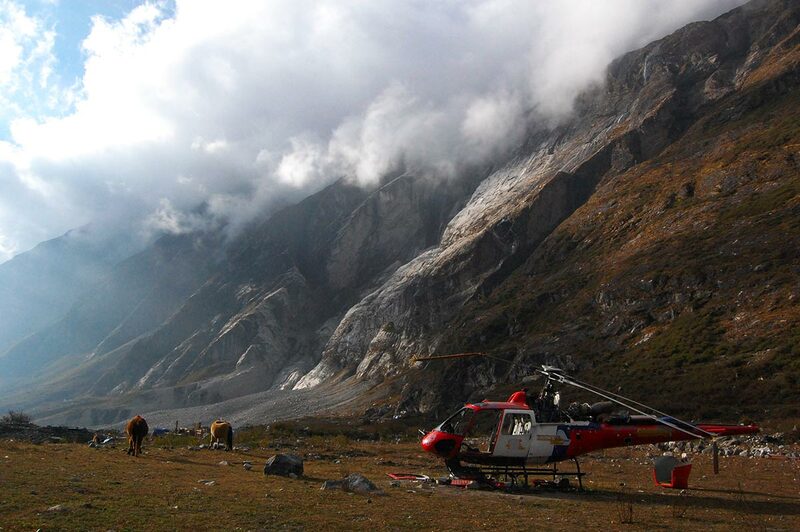 A broken helicopter sits abandoned in Langtang Valley. 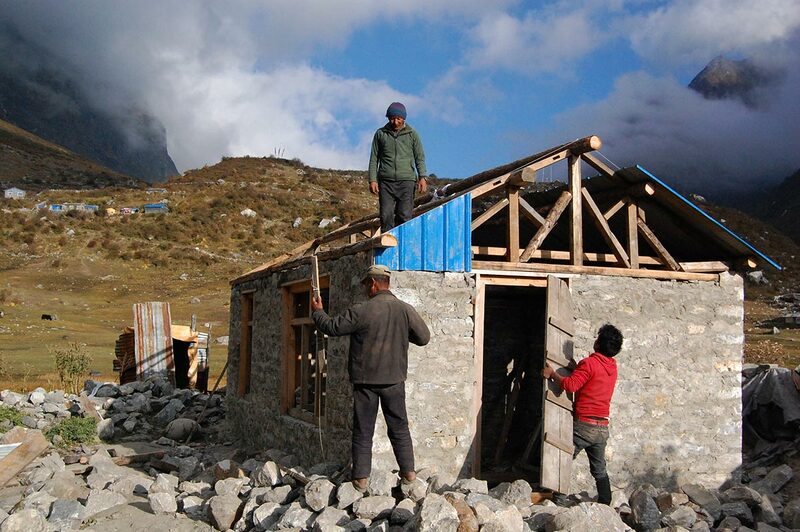 After the wind died down, everybody’s thoughts immediately turned to Langtang. Nearly all the villagers in Kyanjin had family members there, and some trekkers had friends who had set out towards the village earlier that morning. What had become of them? Anxiety soon turned to horror. As they all made their way down the broad stretch of land between the two villages, along a path made unrecognizable by snow and debris, haggard-looking farmers coming the other way told them a consistent yet not quite believable story: Langtang was gone. 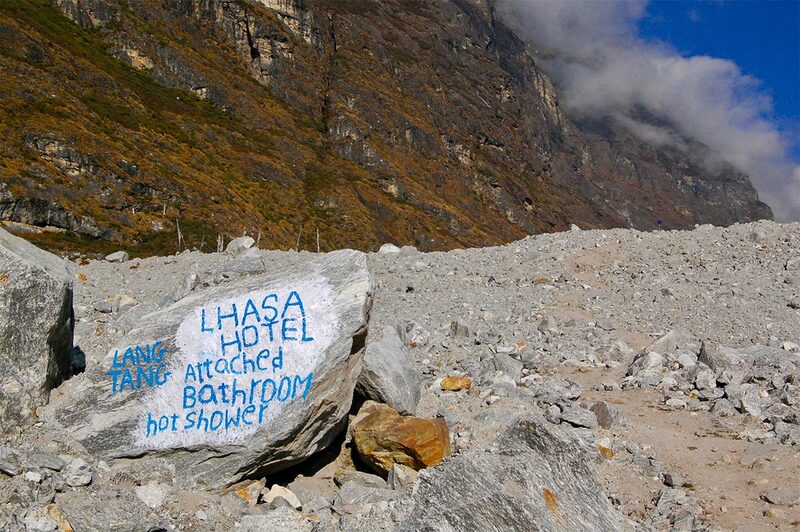 A year and a half later, under a clear blue sky, I linger at the edge of the vast, grey scar of rocks that covers the ground where Langtang once stood. The rocks originally formed part of a glacier. During the earthquake, an enormous chunk of this glacier snapped off, hurtling thousands of feet down the mountainside and slamming into the valley floor. The resulting pressure wave was half as powerful as Hiroshima’s atomic bomb, and it was this “wind” which flattened the pine forest I saw on my way up, and made Langtang’s destruction so total. Rebuilding the village, stone by stone. Sitting on one of these glacial boulders, shielding his eyes from the bright afternoon sunlight as he talks to me, is Tsering Pasang, owner of Lhasa Hotel & Lodge. He is waiting for trekkers to pass this way, he says, so he can persuade them to stay in “Langtang”—the name given to what is effectively a brand-new cluster of buildings erected among the ruins of the original village. These days, he explains, most trekkers continue to Kyanjin, choosing to avoid the atmosphere of tragedy that still clings to this part of the valley. After hearing Tsering’s story, I decide to stay in his lodge. I want to get a sense of how the reconstruction efforts are going, what still needs to be done and what locals think the future might hold. You’ve got to grab the trekkers however possible. Tsering slowly escorts me across the Scar. A herd of yaks clatter among the rocks high above me. Below, the hidden river thrashes and churns at the beginning of its long journey to the Ganges and the Bay of Bengal. As I walk, I scan the boulders for signs of the old village. A few ragged prayer flags are all I can find. When we reach the far side of the Scar, I spot a large circular array of prayer banners—white, yellow, red, blue and green—assembled around a rectangular stone monument. I walk over to get a closer look. The words “Memorial Mani Wall” are carved into the stone—a reference to the Tibetan Buddhist devotional walls, replete with prayer wheels and religious scripture, that mark the entrance to most villages in this region. “For the loved ones who lost their lives,” it reads. 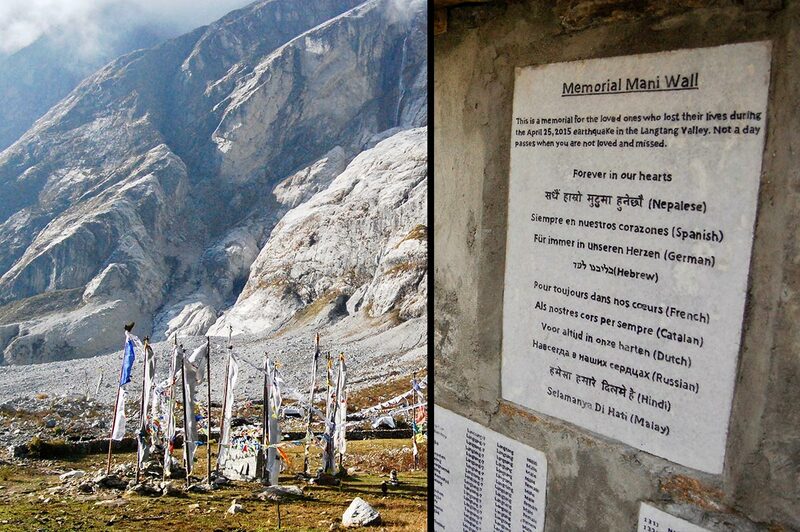 “Not a day passes when you are not loved and missed.” Beneath this inscription, carefully carved, are the names of some 175 Nepalis and 41 foreigners who died in Langtang alone. We continue onward to the partially reconstructed village. This area, the upper part of old Langtang, wasn’t totally buried by the landslide, but was instead ripped apart by the pressure wave. When I go for a stroll at sunset, I can still see splintered wood and piles of stone where the original houses once stood. Had I visited a few months earlier, I might have felt utterly dejected by this experience—but instead, much of what I see makes me optimistic. In one spot, it’s possible to look out across a patch of debris glinting in the dying sunlight, and then swivel on my feet and come face to face with a new, brightly painted house. Fields are slowly being cleared, crops planted and pastures irrigated so yaks and mules can graze freely once again. A couple of pop-up shops have even started selling yak cheese. Later that evening, I sit on a bench in the dining room of my lodge, warming my feet by the hearth fire and sipping a mug of steaming hot chocolate. On the far side of the room, Tsering’s wife prepares a cauldron of dal bhat—a rice and lentil curry combination that remains a popular staple throughout Nepal. Nearby, Tsering feeds honey-smeared chapati to his three-year-old daughter, who makes it clear that she has little regard for either honey or chapati. Three other daughters march noisily in and out of the room, completely oblivious to the serious adult world around them. As I observe Tsering’s relaxed family life, I remember what he told me when we met earlier that day: that his youngest daughter was killed in the earthquake. 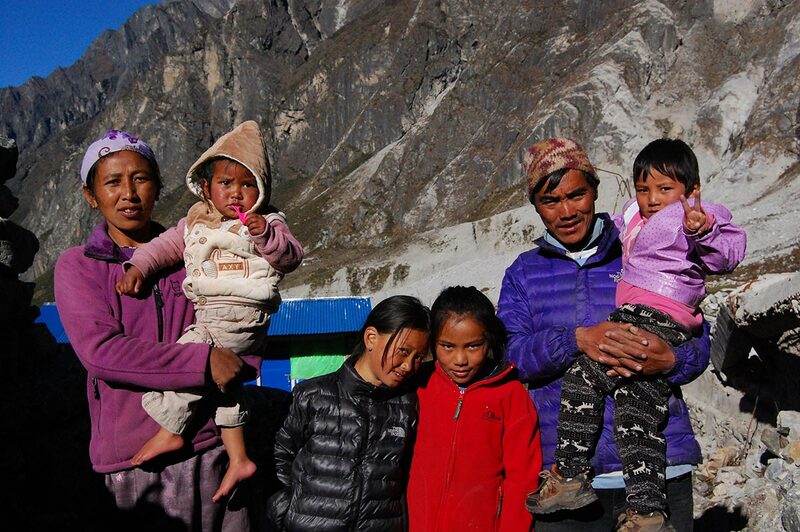 Tsering Pasang, his wife and their four surviving daughters. This struck me as tragic at the time, of course, but it’s not until I meet the four remaining daughters—watching the changing expressions of their young faces, the quick successions of laughter and tantrums, the games played with such infectious enthusiasm—that the meaning of Tsering’s words fully hit home. Later I hear the story of another local man, Gyalbu. His lodge in Mundu, farther up the valley from Langtang, was seriously damaged by the pressure wave but nevertheless remained functional. But it didn’t matter, because he was too heartbroken to keep working—his wife died in the earthquake, depressing him so much he could barely muster the will to return to Langtang at all. But scant information exists to spread this news. Trekking agencies still peddle the false impression that Langtang is unsafe, and many guidebooks haven’t yet updated their trekking sections. Even when I decided to visit Langtang, in October 2016, I didn’t find a single reliable source confirming it was possible. All I had to go by was an online message board, where several independent trekkers had reported that the valley was indeed open for business. “If the tourists don’t come soon, we’ll have to go back to farming,” Sherap laments, shaking his head. “The trekkers who come now… it’s not enough.” And if Langtang is forced to revert to a subsistence economy, as many locals fear, it means that opportunities will once again be as limited as they were two generations ago. If Gyalbu’s new lodge doesn’t generate enough income, for instance, he might not be able to pay for his daughter’s nursing training in Kathmandu. Such an outcome would be a second tragedy—but this time, it’s an avoidable one. Matt is a writer from New Zealand, currently based in the Balkans. His interests include history, travel, politics, and panipuri. You can find more of his work at his website, matthayeswrites.com. In November (2016) I went on a trek in Lantang National Park. 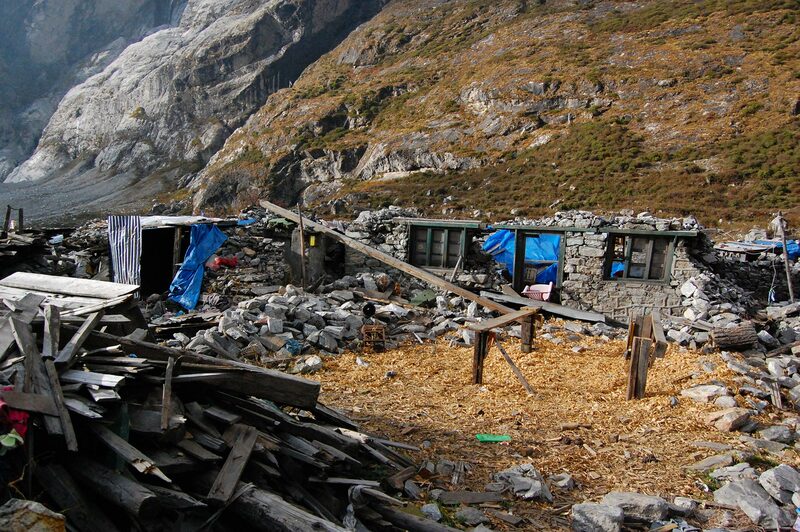 We crossed the avalanche that buried the village and camped in Kjangan Gompa. I would say that one should not hesitate to visit this area. As the author indicates the rebuilding is happening stone by stone. There are no roads and any supplies need to be trekked in or brought in on pack animals. A couple of relevant books are Earthquake Nepal 2015: The Human Story (https://www.pilgrimsonlineshop.com/3960-earthquake-nepal-2015-the-human-story.html), and The Earth Moved by Row Smith (https://www.amazon.com/Earth-Moved/dp/1540868192/ref=sr_1_3?ie=UTF8&qid=1516847716&sr=8-3&keywords=The+Earth+Moved). Happy Trekking! Hope the trekkers start returning. I was in Langtang Village in 2013. Lovely place. The earthquake was heartbreaking. Thanks for bringing attention to this little corner of the world.